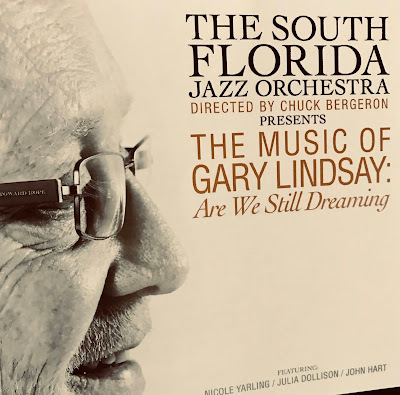 Music Man Blog: CD Review: "The Music of Gary Lindsay: Are We Still Dreaming" Featuring the South Florida Jazz Orchestra"
CD Review: "The Music of Gary Lindsay: Are We Still Dreaming" Featuring the South Florida Jazz Orchestra"
Grammy-nominated Arranger Gary Lindsay has released a new CD, "The Music of Gary Lindsay: Are We Still Dreaming" featuring The South Florida Jazz Orchestra. 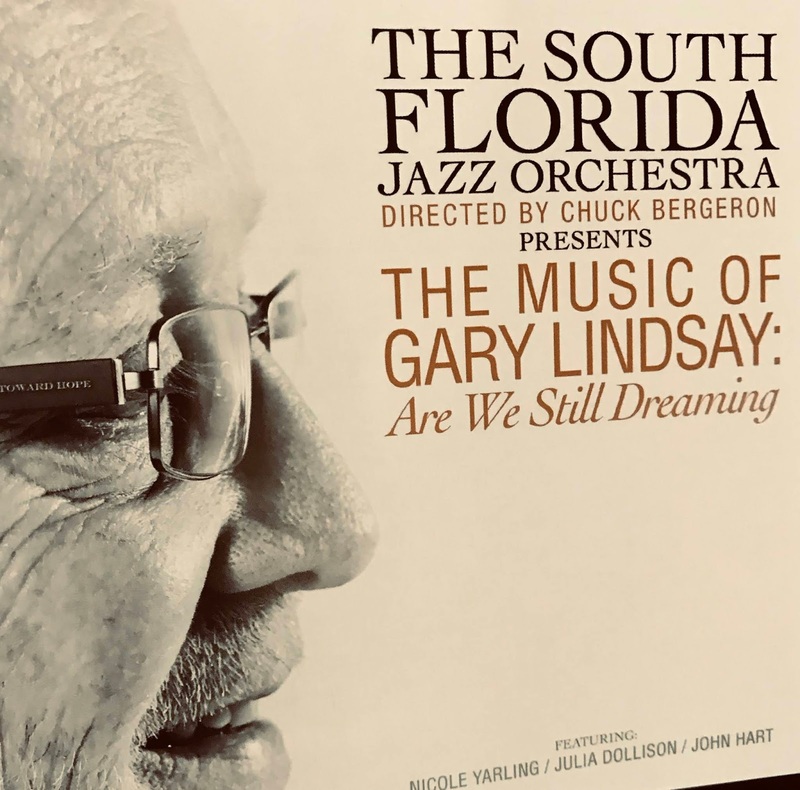 Gary Lindsay has written big band charts that have been performed by everyone from Maynard Ferguson and the Atlantean Driftwood Band to the Airmen of Note and the Florida Philharmonic. This is Gary's first CD that is devoted entirely to his big band arrangements. Gary Lindsay is also an Alto Sax player and performs, records and arranges for the Miami Saxophone Quartet. To say he is a gifted Arranger would be a serious understatement. He arranges in the tradition of Stan Kenton, Maynard Ferguson and all the other great big band arrangers of the 50's and 60's. His arranging is thoughtful, spirited, traditional and, yet, new and inspiring. I have to hear a new CD several times in order to really get a clear feel as to its message. Not so with this CD. The South Florida Orchestra is so talented and performs seamlessly on every song with wonderful arrangement. Anyone who likes the big band Jazz sound will flip over this CD. 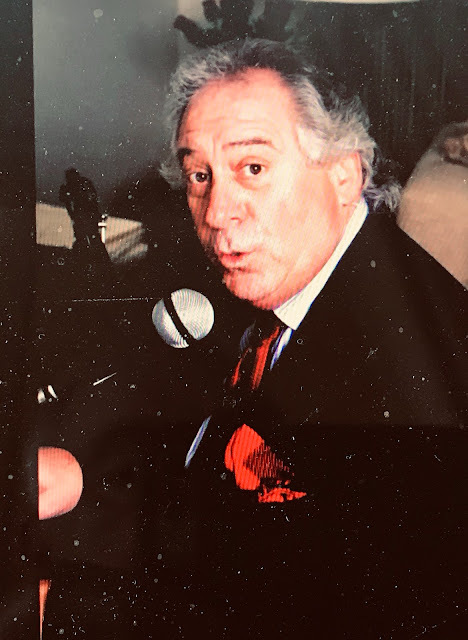 The orchestra was directed perfectly by Chuck Bergeron who let the players and singers have their way without any loss of control of the ultimate sound. The musicians who performed on this CD are all sensational, and I thank them for their world class contributions to this project. Gary Lindsay has received multiple well-deserved awards and I am sure his Grammy nomination for Jazz arranging for Arturo Sandoval's album "I Remember Clifford" is at the top of his list of accomplishments! Doing reviews is not always fun for me , however, getting to listen to this great big band CD one that I probably would have missed if not reviewing, make it all worthwhile! 6. "Are We Still Dreaming"
Rick Margitza- Guest Soloist on "Toward Hope"
I found two "YouTube" videos of two songs from this new CD. Both are just outstanding examples of master Jazz arranging and some of the best Jazz singing and playing you can find anywhere! The first is a medley of "Spring is Here" by Richard Rogers and "Up Jumped Spring" by Freddie Hubbard. There is no way to top this creative combination. The recording features some great singing by Julia Dollison and outstanding solos by Dante Luciani on Trombone and Phil Doyle on Tenor. The second "YouTube" video is a cover on the Thelonious Monk classic "Round Midnight". According to Gary Lindsay, this arrangement was inspired by the Stan Kenton sound. It's a magnificent arrangement that features a soulful sound from Ed Calle on Tenor.